Isaac de Benserade also (according to the Wiki-links) wrote "what cannot be had, you speak of badly," describing cognitive dissonance. The other day I saw an internet meme with text that read "Everyone asks, what the fox does the fox say? No one asks, how does the fox feel." 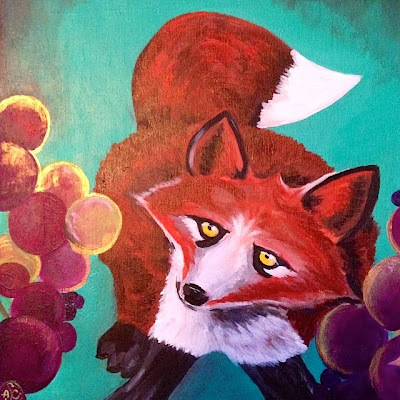 But Aesop wrote a fable about a fox and grapes, and how the fox convinced himself he felt when he could not get them. The painting below is 10x10 inches acrylic on cradled wood panel, and has some shiny gold acrylic in the grapes too. This is a new angle/compositional thing I am trying to have the fox look up and the viewer be looking overhead rather than a profile or three-quarter type view, but I tried to also make him expressive too. The whole thing has a glossy varnish.